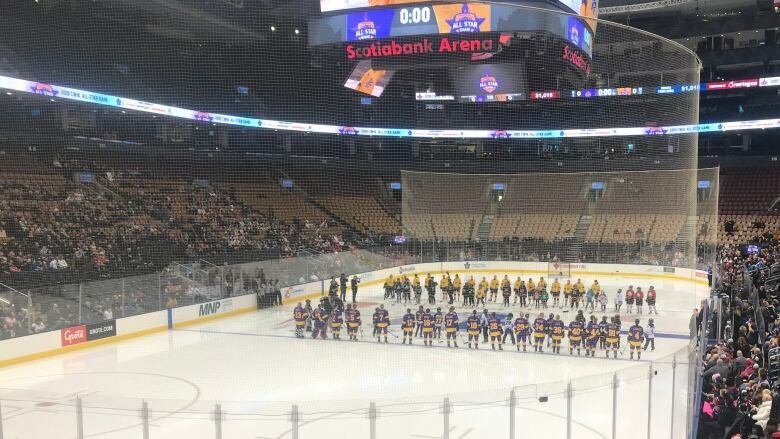 Natalie Spooner and Hilary Knight were among the 34 players on the ice for the Canadian Women's Hockey League all-star game Saturday afternoon at Scotiabank Arena, but the bigger issues facing the sport — especially at club level — weren't far from their minds. Natalie Spooner dreams of a day when women's professional hockey players won't have to rush home from work to make it to practice. Hilary Knight hopes the narrative of the sport's gender inequality eventually fades so she's only asked questions about wins and loses, successes and failures. Spooner and Knight were among the 34 players on the ice for the Canadian Women's Hockey League all-star game Sunday afternoon at Scotiabank Arena, but the bigger issues facing the sport — especially at club level — weren't far from their minds. "When I was little, I was going to play in the NHL," Spooner, who topped the podium with Canada at the 2014 Olympics, said before Team Gold beat Team Purple 8-4 at the home of the Toronto Maple Leafs. "Now the girls are like, 'I'm going to play in the CWHL.' That is a huge step already. "I hope these little girls that are dreaming in the CWHL, when they're older they can have hockey as a career and not have to worry about going to work all day and coming to practice at night." "Unfortunately the way to get a story now for women's hockey is essentially talking about the inequity of the sport," Knight, a gold medallist with the United States at the 2018 Olympics, added. "I hope we get to a place where we do have equality in the sport ... and hopefully that storyline won't be there anymore." According to the players, one way to push the game further ahead and achieve those goals is an oft-talked about merger between the CWHL and North America's other women's pro hockey league — the NWHL. The CWHL has four franchises in Canada, one in the U.S. and another in China. The five-team NWHL is based exclusively south of the border. "It would be awesome," said Canadian national team forward and three-time Olympic medallist Marie-Philip Poulin, who plays for les Canadiennes de Montreal and leads the league with 35 points in 19 games this season. "You want to play with the best." A forward with the Toronto Furies, Spooner said a merger followed by a partnership under the NHL's umbrella would be ideal. "That's what the players would love, having all the best players in one league," she said. "Then I think we'd get the fan base and the support because people don't have to choose between two leagues. "I would hope we would somehow get under the NHL banner." "It's definitely very important," Calgary Inferno defenceman Brigette Lacquette, who won Olympic silver with Canada last February, added. "It would be awesome to have one league under the NHL and have that support, but we've come a long way. "I'm looking forward to the future." "Inevitably one league is the way to go. What iteration that looks like, I'm not sure," said Knight, Poulin's teammate with Montreal. "We don't have enough players right now to field the level of competition that we want dispersed among two leagues. "I want to play the best competition night in, night out, and also genuinely feel proud about that — the product we're providing to the fans and the next generation looking up to see what women's hockey's all about." Brianna Decker, Knight's U.S. teammate and a member of the Inferno, agreed a merger is the only solution. "All the best players in one area and playing one league, that's a big goal of ours," said Decker, who scored twice in Saturday's all-star showcase. "Our ultimate goal is to have one league so that we're all playing against each other every single weekend." The CWHL has the support of individual NHL teams in certain Canadian markets, and has extended its title sponsorship with the NHLPA that will see players wear the union's patch on their jerseys. Saturday's game was televised nationally in Canada, featured celebrity coaches, and saw Leafs great Doug Gilmour drop the puck for the opening faceoff. Knight said she's all for anything the women's game can glean from the best league in the world. "When our male counterparts lend a hand for anything, that's extremely helpful," she said. "I'm all about collaborating and learning from previous mistakes and cutting the learning curve for us to try and get up to speed."